The answer to that question was found in a structure that could simultaneously hold all possible readings of Orwell’s novel – an exemplary instance of doublethink. “There’s a lot in the book that quite deliberately complicates the narrative, and we didn’t want to solve that by undermining it and just opting for one particular reading of it,” Macmillan explains. Every possible interpretation is allowed for. Central to their complex, cerebral version of the novel is the oft-neglected Appendix, which no previous adaptation has attempted to tackle. Macmillan is adamant about the importance of this seemingly dry, academic postscript, which Orwell himself insisted was integral to the tale. “It’s like telling a really long, convoluted joke and then missing out the punchline and feeling like you understand the joke even though you’ve not heard the punchline yet,” he argues. 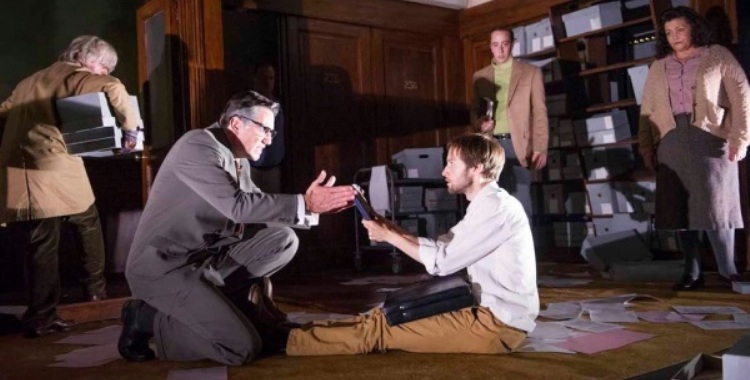 What Macmillan and Icke found frustrating about previous adaptations – and what they have studiously avoided – was the tendency to hone the novel down to the narrative of protagonist Winston Smith’s experience, stripping away its philosophical and political content. “There’s a tendency to over-simplify,” Macmillan suggests, going on to insist that “if you present a literal universe on stage, it’s not accurate to the book”. Instead of opting for a literal narrative, Macmillan and Icke have held onto the subjectivity of the novel, which offers readers intimate access to Winston’s unreliable mind. In doing so, their main reference points have been cinematic – “film can do subjectivity in a way that theatre sometimes struggles with,” Macmillan suggests. He names the likes of Eternal Sunshine of the Spotless Mind, Mulholland Drive (“it’s a deliberate puzzle”) and The Shining. Thanks to working with Mitchell, Macmillan is now much more confident about making work with political intent, something that he suggests “we can find very hard to do in Britain”. The pair’s latest show, The Forbidden Zone, has an explicitly feminist agenda, setting out to “reposition our understanding of certain women and women’s roles in the First World War”. The project has involved extensive research, highlighting for Macmillan just how difficult it is to unearth female perspectives in a history written by men. “One of the things we wanted to do was rehabilitate the writing from that period, this fascinating writing done by so many women, and also these really extraordinary female figures who haven’t been given the right kind of attention,” Macmillan says. He and Mitchell also recently worked together on the German premiere of Macmillan’s playLungs, or Atmen, which continues to play in rep at the Schaubuhne in Berlin. Despite the script’s strict instructions that the play should be staged with no set and no lighting or sound changes, Mitchell has placed the two performers in her production on bicycles, powering the lights throughout the show. This simple, eco-friendly concept acts as a constant visual reminder of the high environmental stakes that provide the backdrop for Macmillan’s two-hander, in which a couple agonise at length over whether or not to have a child. Macmillan has worked in yet another way on Every Brilliant Thing, a project with Paines Plough and Pentabus which goes on tour in its latest incarnation next month. The piece began as a story written by Macmillan, in which a child starts a list of everything that is wonderful in the world as a way of coping with their mother’s suicide attempt. As in the story, the list soon took on a life of its own, welcoming contributions from the public and transforming into an installation created by Paul Burgess and Simon Daw. Now, the story and the installation have been incorporated into a show, performed by Jonny Donahoe of Jonny and the Baptists and involving members of the audience each night.